This year has been a whirlwind already! Our county went back to school 4 weeks ago and the craziness has yet to end. This is my 4th year teaching and I have never felt this frazzled so early in a year. I feel like I am running a never ending, always quickening race. There is just so much going on outside of actual teaching. I am sure that most of you can relate! It seems that it gets a little crazier each year. Despite this craziness, we have lessons plan and to teach! Our third grade team has found an awesome resource that we buy for each Reading Street unit. I LOVE these packets that Sarah Kirby makes. They are so helpful for making my focus wall each week. It saves me SO much work each week to have these pre-made for me. 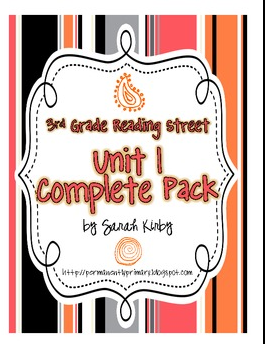 If you are interested in checking Sarah's work out (and I highly suggest you do), then you can find it here for Unit 1 and here for her Teachers Pay Teachers store. She also has a great blog...Permanently Primary. While I like to buy what others have created, I sometimes have a little spare (Ha! Spare, right?) time to create some of my own activities for my classroom. This afternoon, I had some time to myself and my school work, so I made a little math freebie. In math we have been working on rounding. Most of my kiddos are doing really well with it, but some of my little guys need a little extra practice. I made this freebie to practice rounding to the nearest 10. You can find it here. I hope that you all are enjoying this weekend! We have had some beautiful warm weather here in Tennessee. Perfect game day weather for the Vols!